Upgrades your Pulse Jump to charge up a powerful directional boost. Refreshed upon landing. Rocket Jump is a Tech that allows the player to be propelled in a direction after jumping. 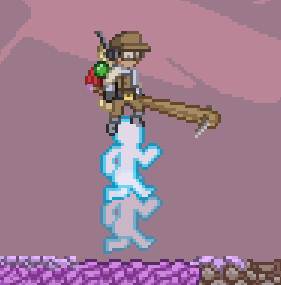 After jumping normally, pressing jump a second time will make the player glow in place for 1 second. After that second the player will automatically eject in the direction being pressed, up by default. This tech will be made available to unlock after players get the Pulse Jump tech. It can be unlocked using 8 tech cards at the tech console or the tech lab of the outpost. By default, the Rocket Jump propels the player at a speed of 40 (for comparison, the default run speed is 14). Unlike the other jump techs, Rocket Jump's effect is improved by Run Boost rather than by Jump Boost, and it is reduced by many Status Effects that slow the player. Cheerful Giraffe: Changed animation and key commands, no longer charges up from ground but instead does so midair.